Hi. 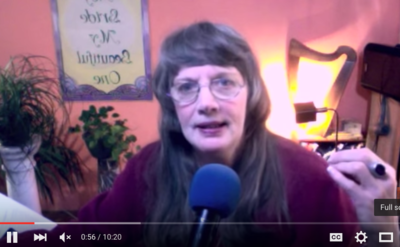 I'm going to talk to you about fear, especially for my dear friend, Trish, who is having some problems regaining her peace after a robbery that took place at her house. The Lord promises us His peace. It's written in John: Peace I leave with you, My peace I give to you. Not as the world gives do I give to you. Do not let your hearts be troubled or afraid. It's written in the book of Job that Satan had to go to God for permission to sift His servant, Job. So, before Satan could do anything to Job, He had to get permission from God. He's on a chain, he can only go so far. But then, there's the whole area of our life, our mental life, that can be affected by impressions. As I had said earlier, there's a mist or fog. I grew up in the Midwest, and in the morning the roads would be misty on some occasions, and you couldn't see ahead. Well, in our minds, the devil likes to project misty images of threatening things. Thoughts that are threatening. "You're going to have an accident. One of your children is going to die. You're going to lose your business." These are like lions that are lunging out at you, except mentally. They're like mental lions. When you take the word of God and you stand on Scripture, the Lord IS our Light, He is our Salvation. And when you stand on a Word, you can speak to that fog, to that mist, to that threat and completely dispel it, just as the sun burns the fog off of the road in the morning. So, let's take a look at a couple of Scriptures to stand on. And when I say stand, what I mean is, when a thought that is threatening or disturbing comes to you, know that this thought is NOT from God - it's from the enemy. He has his little demons that have their way of speaking into our minds. They live in the spirit world, and they have ways of flashing images as well. All of these things can be put on the run and completely dissolved in the light of God's Word. This is not the kind of peace you feel when you have get the laundry done, the dishes done, all the meals cooked and now you can relax and have a good time. No, this is the peace that comes from the spiritual world and it's from the Lord. The Lord lives inside of us. You have invited Jesus into your life. When you open your life and your heart to the Lord and tell Him you love Him and want Him in your life, and you want Him to have control in your life, He comes and enters into your heart and He abides inside of us. He lives inside of us. Even He and the Holy Spirit will bring to mind the Scriptures you need in different situations. The Lord will not allow you to be tested beyond your means. That's in the Scriptures. If you are on a safari, and a lion jumps out of the bushes, well, you've got a gun, you're going to shoot the lion. That's not being tested beyond your means. But He's not going to let a lion jump out of the bushes in front of your house! Images like that, any kind of scary images - being watched, or being troubled - those images are from the evil ones to steal your peace. You can be sure that any time that you lose your peace or your joy, the enemy is behind it. You needn't be afraid of the enemy because Christ dwells inside of you. He will give you the wisdom to discern and to see that a mental attack is coming against you. This is only, again, a mirage, or a fog or mist to steal your joy, to steal your peace. We have no reason to be afraid of demons. Here in the South West were we live now, every once in a while a coyote will come into the yard. Or, anywhere in the country, we have dogs that wander around. If you've got your back door open and a dog wanders into your kitchen, what are you going to do? Are you going to welcome him, are you going to run from him like you are afraid? More likely than not, you'll turn around and you'll say, "Get out of here!!" You might be a dog lover and treat the situation a whole different way - but let's just say the dog came in and lifted his leg on the cabinet. You're going to grab a broom and say, "Get out!" Okay, well when we're talking about a Christian against demons, we're talking about something on that level- we're talking about mischievous, impish creatures that have very little intelligence or they wouldn't be working with Satan in the first place. And within you dwells the Lord. They're afraid of Him - they're afraid of the Name of Jesus! "In the Name of Jesus, you unclean spirit, LEAVE!" Men are very often tormented with sexual thoughts. They aren't coming from inside of them - they may have seen something in the past that could evoke that. But they don't always come from inside a person; they are flashed at them. And you can take authority over things like that by simply saying, 'In the Name of Jesus, the Almighty God of Heaven and Earth, you unclean spirit. I bind you and command you to leave and never return." Take authority. Just like the dog who walks in to your kitchen and messes on your cabinets. You have all the right in the world, all the authority in the world, you have all the power in the world. In the Name of Jesus. You needn't be afraid of these things. Some of what I've been saying - if your peace leaves you and you have fearful thoughts, run to the Scriptures. Pray. Ask the Holy Spirit to give you a Scripture. We like these little Bible Promise books, they're pretty useful. They have topics on Fear and different things. Joy. Lust. Money and the World. God's Love. Humility. Things like that. So when you are troubled by Pride or a Lustful thought, troubled by a Fearful thought, you can turn to that chapter and there are beautiful Scriptures to choose from. And the way the Lord works, the Holy Spirit works is, He will quicken to you a word. There might be 8 Scriptures on that page, and one will feel like a butterfly in your heart - it will just be quickened, and you'll feel it inside. And you'll say, "That's the one. That's the one I need to memorize, that's the one I need to stand on. That's the one that will get the job done." And you take that Scripture into your mind, into your eye gate, your ear gate, your heart. You speak it out. And the demons tremble! They are afraid of the Word of God, and they're afraid of the Name of Jesus. And you have that authority, because He's living in you. So, try no to be troubled. Rely on the Lord, His goodness, His mercy, and especially the power of His Name.